Terms for Nazi Germany's unconditional surrender were set at the historic Yalta Conference in February of 1945. This was to be the last page of history written by the wartime president, Franklin D. Roosevelt. He made a report to congress on the meeting, obviously a very sick man. 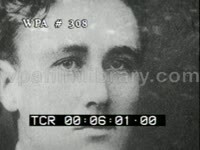 Six weeks later he died at Warm Springs, Georgia. 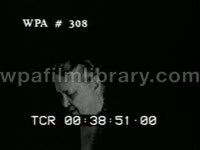 Includes footage of Roosevelt's and Churchill's daughters attending the conference as aides. Roosevelt speaks of his polio. Roosevelt's last public appearance. 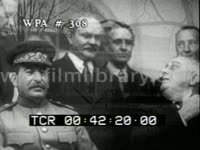 Quote of "no repite... until unconditional surrender" Yalta, Crimea, Soviet Union A MCUS of Secretary of State Edward R. Stettinius Jr. and his British and Russian counterparts. MCUS - Winston Churchill disembarking from a plane. MCUS - President Franklin D. Roosevelt and unknown Russian Diplomat. (It could be Molotov) CUS - Roosevelt's daughter - Anna and Churchill's daughter. - Mary. 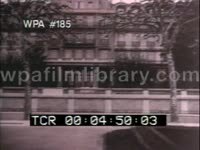 Outside shots - Former Imperial Palace at Livadia, Yalta of Czar Nicholas. CUS - Gary Hopkins and Sir Anthony Eden. CUS - Prim Minister, Marshal Joseph Stalin. MCUS - The big three plus other diplomats sitting out at a large round table. MCUS - Prime Minister, Winston Churchill, US President, Franklin D. Roosevelt and Marshall Joseph Stalin. Washington, DC MS - Joint session of congress upon the return of President Roosevelt. 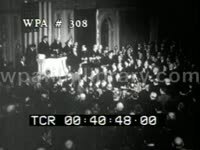 President Franklin Roosevelt addresses Congress sitting down: "Mr. Speaker and members of the Congress. I do hope you pardon me for an unusual posture of sitting down, in a presentation of what I want to say. I know that you all realize that it makes it easier for me, in not having to carry about 10-pounds of steel around on the bottom of my legs and also because of the fact that I have just completed a 1,400-thousand mile trip." (Congress applause the President). "There will be no respite to these attacks. We will not resist for one moment until unconditional surrender." At Warm Springs, Georgia, As the National Foundation for Infantile Paralysis opens the 20th March of Dimes, a plaque honoring pioneers in the fight against polio is dedicated. Establishing shot - A sign Georgia Warm Springs Foundation, posted in a wooded area. MCUS - Three men sitting in front of a building who have been afflicted with Polio. MS - People wheeling people in wheel chairs into a building. CUS - A standing member of the foundation and other members as well. MS - Among the men stand two women, one I think is Eleanor Roosevelt. Text VO, "We have actually been at war since the day when we lifted the flag of our revolution against the democratic world. Benito Mussolini," Coliseum in BG. MS Benito Mussolini saluting w/ statue of Julius Caesar in BG. Text VO, "The Germans are a noble and unique race to whom the earth was given by the grace of God. 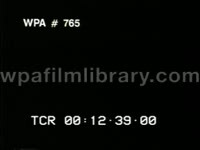 Adolph Hitler, Mein Kampf page 827." MS Hitler. Text, VO "The world must come to look up to our emperor as the great ruler of all nations, ...Premier of Japan." MS/MCU Japanese saluting emperor. Montage of cheering crowds, MCU image of Hitler, Mussolini & Hirohitio. MCU Statue of Liberty, Text, "We hold these truths to be self evident that all men are created equal." Montage, freedom of speech, religion. MS Lincoln memorial. MCU axis leaders, Hitler, Mussolini & Hirohito. 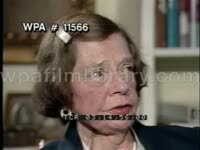 MS American people interviewed, "December 1938 Should the United States increase the strength of its Army, Navy and Air force, yes 85%." Text, "Military Affairs Committee House of Representatives." MS/MCU Rep. Andrew J. May urges arming before the House Military Affairs Committee. Sec. of the Navy Charles Edison asks the Naval Affairs Committee for funds. Text, U.S. Military Budget 1&1/2 billion 1939, (largest in peacetime up to that point, 1943 much larger) 81 billion." Text. "March 14th 1939." CU map of Europe Germany takes the rest of Czech-Slovakia. CU smiling Hitler. 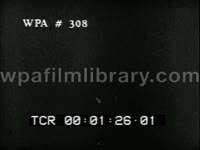 Text, "April 7th 1939." (good Friday) MS churches. MS American man selling paper, "Italy attacks Albania." TLS Italian ships firing. MS Italian Army marching into city. MS more soldiers (German & Italian) troop marching. MCU FRANKLIN DELANO ROOSEVELT at desk. 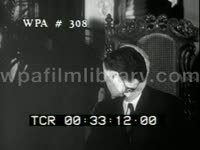 (asking Hitler & Mussolini to respect independence) TLS Hitler ridicules FDR's peace proposal before the Reichstag. Text, "In Cairo, President and Prime Minister meet with China's Generalissimo Chiang Kai-Shek." MS U.S. President FRANKLIN DELANO ROOSEVELT (Franklin Roosevelt, FDR, Franklin D. Roosevelt) and British Prime Minister WINSTON CHURCHILL (Churchill.). MCU Winston Churchill in white suit w/hat on knee. MCU CHIANG KAI-SHEK. Text, "Japan's fate is planned. Teheran, Iran (Persia) Russia's Premier Marshall Stalin arrives." MS JOSEPH STALIN (Josef Stalin). Text, "-to join Roosevelt and Churchill. Future attacks against Hitler are planned." 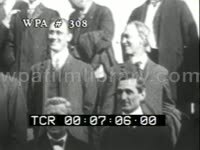 MS three leaders seated, FDR smiling. Text, "President Roosevelt introduces Sarah Churchill Oliver to Stalin!" MS shakes hands with SARAH CHURCHILL OLIVER. Text, "Churchill presents "The Sword of Stalingrad" to Stalin!" MSs Stalin receiving sword, FDR looking at it. Text, "U.S. Marines Capture Tarawa!" TLS ship on water. Text, "U.S. ships laden with Marines steam toward Gilbert Islands!" TLS ships moving. MS of the two sitting at military ceremony, singing (at Atlantic charter summit). Newsreel of Yalta Conference, 1945, Churchill, Roosevelt & JOSEPH STALIN meeting, sitting outdoors for press op (FDR looks tired, haggard, weak). Use catalog # 494617 Excerpt of FDR speaking to Congress, Dec 8, 1941. C/As of the Japanese ambassadors, American people listening to car radios in streets. 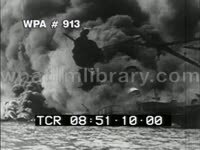 "Mr. Vice President, and Mr. Speaker, and Members of the Senate and House of Representatives: Yesterday, December 7, 1941 a date which will live in infamy the United States of America was suddenly and deliberately attacked by naval and air forces of the Empire of Japan. The United States was at peace with that Nation and, at the solicitation of Japan, was still in conversation with its Government and its Emperor looking toward the maintenance of peace in the Pacific. 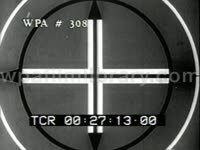 Indeed, one hour after Japanese air squadrons had commenced bombing in the American Island of Oahu, the Japanese Ambassador to the United States and his colleague delivered to our Secretary of State a formal reply to a recent American message. ... Japan has, therefore, undertaken a surprise offensive extending throughout the Pacific area. The facts of yesterday and today speak for themselves. ... No matter how long it may take us to overcome this premeditated invasion, the American people in their righteous might will win through to absolute victory. (applause) ... With confidence in our armed forces- with the unbounding determination of our people- we will gain the inevitable triumph- so help us God." Wide MS of Franklin Roosevelt and Pershing meeting in the Oval Office. He receives an award from Roosevelt. 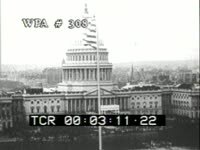 Franklin D. Roosevelt addressing the American public about diplomatic recognition of the Soviet Union (includes real audio). Trade returns to Soviet Union. Cargo moving into the country. TLS President FRANKLIN DELANO ROOSEVELT (FDR, Franklin D. Roosevelt) seated at desk with figures, crowd stands behind. MS FDR watches foreign leaders sign pact of mutual aid against aggressors. ECU pact document w/signatures. Big Three conference at Yalta. Big Three conference at Yalta. Livadia Palace near Yalta, the Crimea President Franklin D. Roosevelt, Prime Minister Winston Churchill, and General Secretary Joseph Stalin sitting outside for photo. Men meeting around the round conference table. 14.29 FDR tour Yalta in jeep after conference. 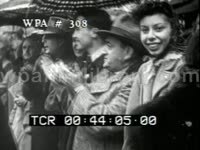 Clip of Roosevelt, stating, "The American people, in their righteous might, will win through to absolute victory" Propaganda song "We Did It Before and We Will Do It Again" plays while various crowd scenes from around Washington clip through. Shore describe the new, fast paced energy of wartime Washington. 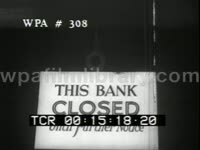 Short clips show city streets, crowded hallways, a sign that reads "War Workers Need - Rooms, Apartments, Homes - Register Your Vacancies Now," lines and a upscale bar / lounge. People signing up for defense jobs. Franklin D Roosevelt, wife Eleanor Roosevelt, and the immediate family on the patio of their Hyde Park home, posing for camera. 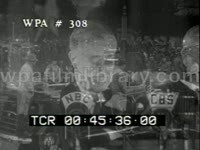 FDR talking to the camera, introducing the Roosevelt family, the camera panning to each of them as they introduced. 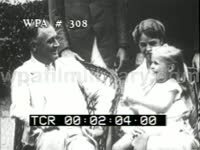 FDR, Eleanor and their eldest grandchild, a cute little blond girl named Sissy. FDR asks, "What's our campaign slogan, Sissy?". Sissy replies, "Happy days are here again." Appears to have been taken during 1932 Presidential campaign. 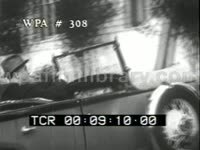 Franklin D Roosevelt sitting in car. March 4, 1933. 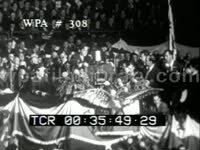 First Inauguration of Franklin D Roosevelt . High angle Capitol Building, an American flag flying in foreground. Tilt-down the Capitol dome. 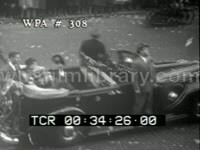 FDR, in top hat, making way to gallery. Crowd gathered at Capitol steps. 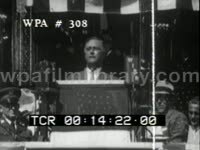 FDR delivering his inauguration speech "This is a day of national consecration. And I am certain that on this day my fellow Americans expect that on my induction into the Presidency I will address them with a candor and a decision which the present situation of our People impels. First of all, let me assert my firm belief that the only thing we have to fear is fear itself. This Nation is asking for action, and action now." Audience members listening. Inaugural parade through the streets of Washington DC. 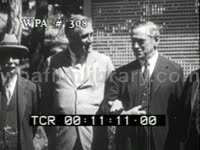 Franklin D Roosevelt meeting and greeting the public. Travelling shot of a crowd lining the sides of a street for a parade. President Wilson with FDR. Young Franklin D Roosevelt at ceremony, then on street, then on deck of a naval boat with sailors during snow storm. FDR smiles, bundles up and they sail away. Tilting TLS of a docked Navy ship at a christening ceremony. 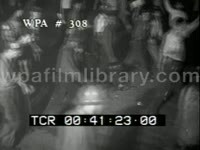 FDR in attendance, bottle is smashed, ship is shoves off from mooring. Other shots of Roosevelt in Washington. Presidential election campaign of 1920. Men in straw boater hats marching on a side street. Ohio Governor and Democratic Presidential candidate James Cox delivering a speech. 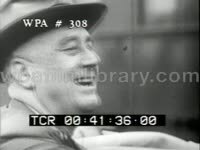 Cox and his running-mate Franklin D Roosevelt talking on a moving train, panning Outdoor crowd waving their boater hats, smiling. FDR standing on the front steps of an undisclosed building. A male Native American in full regalia walks along and taps him on the shoulder. They shake hands and smile egregiously (a very staged, hammy press op). 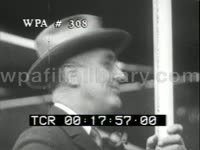 FDR at outdoor speaking engagements. A lighthouse and sailboat in New England, people standing on shore waving. Sailboat coasting in the water, Franklin D Roosevelt at the helm. Eleanor Roosevelt and the Roosevelt children. FDR writing at a desk. MS of FDR standing in doorway of home with a walking cane (stricken by polio). FDR and Eleanor standing outside their home. FDR swimming at Warm Springs, Georgia, (physcial therapy for polio). FDR driving a convertible, smoking a cigarette. Democratic National Convention. Crowd shots in convention hall, delegates waving banners and signs. Franklin D Roosevelt speaking to delegates. He nominates Al Smith. Several Alfred E. Smith signs. Al Smith waving and smiling. Franklin D Roosevelt and Al Smith metting, shaking hands in room. 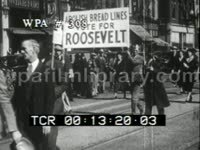 FDR campaigns for Governor of New York. 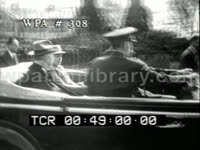 FDR meeting the public, riding in convertible. 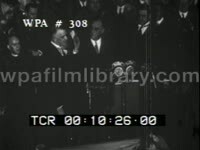 FDR is sworn in to office. New York Governor, Franklin D Roosevelt, meets with various political dignitaries. FDR Well, it s been a great delight to be with you, these distinguished friends of mine today. And I wish very much that I could come down here this summer instead of having to spend the summer in the hot capitol of the state of New York. Unidentified official, We have a feeling that you shouldn t continue to come here as Governor. You should come in a more exalted capacity. And so we re looking forward to welcome you as President sometime within the next two years. The 1932 Democratic National Convention. 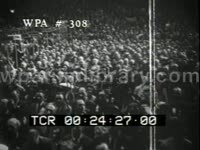 Delegates crowd on convention floor. 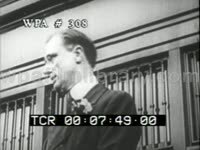 Announcement that Franklin D Roosevelt is nominated for the democratic ticket. Celebration, hat waving, banner boasting, toothsome displays. 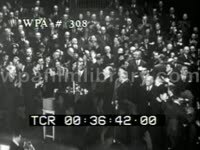 Franklin D Roosevelt walking with assistance form his son to podium, waving to crowd, finally making an acceptance speech, "I pledge myself to a New Deal for the American people. This is more than a political campaign, it is a call to arms. Give me your help, not to win votes alone, but to win in this crusade to restore America to its own People." October 31, 1932. Franklin D Roosevelt in Boston Now let s be frank. You and I know that immediate relief of the unemployed is the immediate need of the hour. The present leadership in Washington stands convicted, not because it did not have the means to plan, but fundamentally because it did not have the will to do. Franklin D Roosevelt on balcony shortly after being elected President. Sideview of FDR sitting at a desk, writing, signing legislation. Franklin D Roosevelt driving a convertible by a crowd of children holding American flags in Warm Springs, Georgia. MSs of children afflicted by polio related infantile paralysis sitting in wicker chairs at a Thanksgiving dinner. FDR jokes with the children about spinach before carving the turkey, Eleanor Roosevelt at his side. Cute Caucasian girl eating turkey, smiling. March 4, 1937. Address at the Democratic Victory Dinner. Washington DC. Franklin D Roosevelt speaking The Democratic Administration and the Congress made a gallant, sincere effort to raise wages, to reduce hours, to abolish child labor, to eliminate unfair trade practices. And what happened? And what happened? if we would make democracy succeed, I say we must act NOW! March 9, 1937. Fireside Chat. Franklin D Roosevelt What do they mean by the words "packing the Court"? Let me answer this question with a bluntness that will end all honest misunderstanding of my purposes. 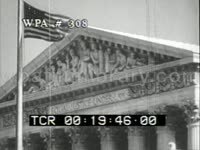 If by that phrase "packing the Court" it is charged that I wish to place on the bench spineless puppets who would disregard the law and would decide specific cases as I wished them to be decided, I make this answer: that no President fit for his office would appoint, and no Senate of honorable men fit for their office would confirm, that kind of appointees to the Supreme Court of the United States. Sailing montage, New England. Sailboat on water. President Franklin D Roosevelt and his sons on boat. 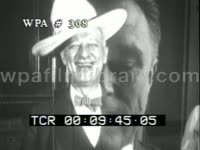 FDR wearing floppy hat. Franklin D Roosevelt Oval Office, conferring with aides. Franklin D Roosevelt and family at Hyde Park home. FDR driving a convertible, the top down, his grandkids in the backseat. 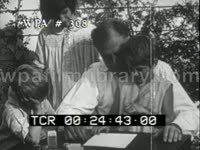 FDR surrounded by three grandchildren. Franklin D Roosevelt looking through stacks of mail and telegrams in office while his mother Sara Delano Roosevelt watches on. 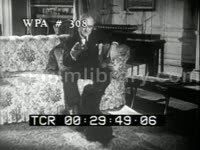 President Franklin D Roosevelt takes off glasses. President Franklin D Roosevelt sitting on a couch in a living room of Hyde Park, NY, home, playing with his small black Scottie dog, Fala. President Franklin D Roosevelt in Oval Office, signing bills and meeting with reporters. October 23, 1940. 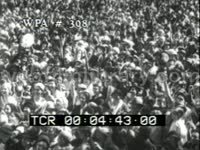 Campaign Address at Philadelphia, Pennsylvania. President Franklin D Roosevelt I consider it a public duty to answer falsifications with facts. I will not pretend that I find this an unpleasant duty. I am an old campaigner, and I love a good fight. October 23, 1940. 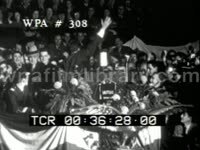 Campaign Address at Philadelphia, Pennsylvania. 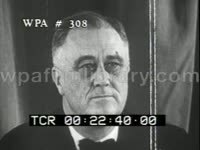 President Franklin D Roosevelt We know, if we but look at the record, that American business, big and small business, is way up above the level of 1932, and on a much sounder footing than it was even in the twenties. October 28, 1940. Campaign Address at Madison Square Garden, New York City. President Franklin D Roosevelt the Republican Party, through its leadership, played politics with defense, the defense of the United States, in 1938 and 1939. And they are playing politics with the national security of America today. October 23, 1940. 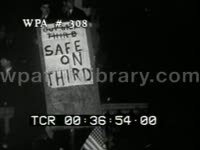 Campaign Address at Philadelphia, Pennsylvania. 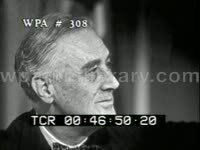 President Franklin D Roosevelt We will not participate in foreign wars and we will not send our army, naval or air forces to fight in foreign lands outside of the Americas except in case of attack. October 23, 1940. 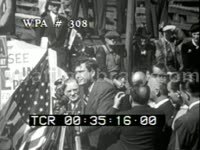 Campaign Address at Philadelphia, Pennsylvania. 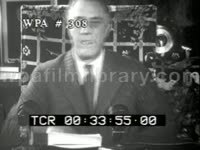 President Franklin D Roosevelt The American people will not be stampeded into panic. The effort failed before and it will fail again. President Franklin D Roosevelt supporters gathered outside the Roosevelt home in Hyde Park, New York. FDR with his family outside their home. January 20, 1941. Inauguration Day. President Franklin D Roosevelt being sworn into office by Chief Justice Charles Evans Hughes. FDR speaking. President Franklin D Roosevelt inspecting Army troops while riding in Jeep. December 8, 1941. President Franklin D Roosevelt speaking to Joint Session of Congress I ask that the Congress declare that since the unprovoked and dastardly attack by Japan on Sunday, December 7, 1941, a state of war has existed between the United States and the Japanese Empire. US soldiers passing the camera, rifles with bayonets shoulder bound. Soldiers mobilize as the US enters the war effort: tanks, soldiers, GI deployment, male and female war workers. President Franklin D Roosevelt touring a plane factory, an employee presenting with a scale model of a USAAF fighter bomber. November 1943. Tehran conference. Franklin D Roosevelt, Soviet Premier Joseph Stalin and British Prime Minister Winston Churchill posing for camera, chatting. Roosevelt home in Hyde Park, NY. The Roosevelt clan standing by Christmas tree, posing for camera. Franklin D Roosevelt and Eleanor Roosevelt at dinner table. September 23, 1944. Dinner of the International Brotherhood of Teamsters, Chauffeurs, Warehousemen and Helpers of America. Fala Speech. 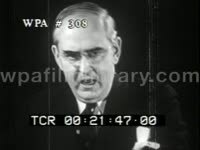 Franklin D Roosevelt, These Republican leaders have not been content with attacks on me, or my wife, or on my sons. No, not content with that, they now include my little dog, Fala. 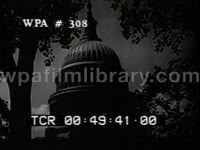 You know, Fala is Scotch, and being a Scottie, as soon as he learned that the Republican fiction writers in Congress and out had concocted a story that I had left him behind on the Aleutian Islands and had sent a destroyer back to find him at a cost to the taxpayers of two or three, or eight or twenty million dollars- his Scotch soul was furious. He has not been the same dog since. November 10, 1944. 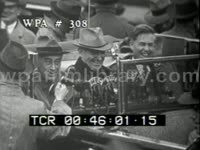 Franklin D Roosevelt, Vice-Presidential candidate Harry S Truman and Vice-President Henry Wallace sitting in convertible together, being interviewed by reporter. and when I say welcome home, I hope that some of the scribes in the papers won't intimate that I expect to make Washington my permanent residence for the rest of my life. 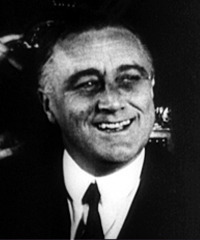 Franklin D Roosevelt looking into camera, laughing. 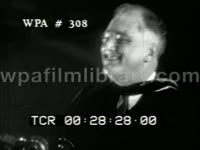 FDR running through rehearsal test-reel with news crew in order to best deflect his haggard, tired mien; glasses (pince nez spectacles) on, then off; profile shot. February 1945. Yalta Conference. Soviet Premier Joseph Stalin, British Prime Minister Winston Churchill and President Franklin D Roosevelt arriving, meeting, then posing for pictures on lawn. 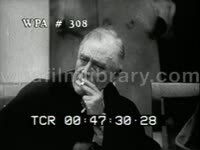 FDR smoking cigarettes. March 1, 1945. Franklin D Roosevelt speaks to Congress " I hope that you will pardon me for this unusual posture of sitting down during the presentation of what I want to say, but I know that you will realize that it makes it a lot easier for me not to have to carry about ten pounds of steel around on the bottom of my legs; and also because of the fact that I have just completed a fourteen-thousand-mile trip. Days were spent in discussing these momentous matters and we argued freely and frankly across the table. But at the end, on every point, unanimous agreement was reached. And more important even than the agreement of words, I may say we achieved a unity of thought and a way of getting along together. Franklin D Roosevelt arriving at infantile paralysis home in Warm Springs, Georgia. Children afflicted by polio related paralysis waving and applauding. April 14, 1945. 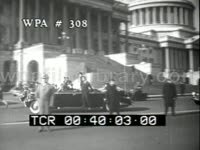 Franklin D Roosevelt funeral procession through Washington DC. Funeral route, casket, weeping crowds of Caucasian and African-Americans, saluting officers, arrival at the White House. Funeral at Hyde Park, NY. Casket is lowered into ground, President Harry S Truman. The American flag is folded by 10 officers, gun salute.